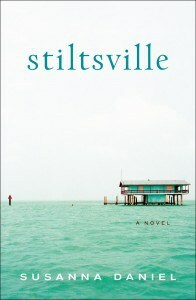 Stiltsville, the debut novel by Susanna Daniel, spans over 20 years in the lives of one family, their friends, and offspring as they experience all facets of life. It was the summer of 1969 when Frances met Dennis DuVal in Biscayne Bay. She was utterly captivated by the ocean, and moved to Miami to begin a new life for herself–one that would would hopefully include Dennis. Eventually the two married and lived in Miami while still keeping the house Dennis’s father built, one that was built right into the ocean supported by strong beams. Many happy memories are formed in the isolated ocean home that is part of a community called Stiltsville. After a forceful hurricane destroys it and some of the neighboring stilt houses, Frances and Dennis spend the rest of their lives inland. Though their lives together are mostly carefree and happy, Frances’s love and loyalty is put to the ultimate test, their daughter Margo experiences disappointment with her own failing marriage, and in the later years of their lives Dennis finds himself dependent on family and friends to see him through an illness. Although Susanna Daniel has a beautiful and thought provoking writing style, which is probably what kept me from putting the book down permanently, I found it very hard to relate to the characters and the situations in which they found themselves. I was also hoping that more time would be spent in the stilt houses, and that I would be introduced to an eccentric cast of secondary characters. Instead, the story is narrated by Frances, and most of the plot occurs in Miami and mostly not on the water. I didn’t find any of the characters particularly interesting, nor their lives. About halfway through to add some excitement, a serial killer murders several students in the Gainesville community where Margo attends college. It was at this point that the book suddenly turned into a page-turner; that is, until the killer was caught and then sentenced. I realized while reading this that while I enjoy character growth and development, I prefer quite a bit more spice in the plot; reading about a middle-aged woman who constantly reflects on the fluctuations in her weight is not exactly exciting to me. The use of foreshadowing throughout the novel did keep me going for the more mundane sections; Frances is upfront with telling the reader that something devastating will occur in her marriage, and I wanted to know what that might be. I admire Ms. Daniel’s effort, but overall this just wasn’t the book for me. It was interesting to learn about some of the historical events in Miami’s past, but some liberties were taken with the timeline as noted in the Author’s Note at the end of the book.